From towering skyscrapers to eclectic streets and an award-winning food scene, Tokyo is Japan’s most populous city and is regularly ranked among the most liveable in the world. The city of over nine million people is broken into 23 different neighbourhoods (known as wards), each with its own special appeal. Ginza is known for its high-fashion boutiques, Asakusa boasts the city’s largest Buddhist temple, Senso-ji and Shibuya is home to the world’s busiest pedestrian crossing. Tokyo is easily explored on foot but its sophisticated public transport system weaves across the city and connects each area seamlessly. The history of Tokyo dates back around 400 years when it was a modest fishing village known as Edo. During this time, Kyoto was the imperial capital of Japan. It wasn’t until the Tokugawa Shogunate was established in the early 17th century with Edo as its capital, that the population boomed. This Shogunate was the most powerful government in Japanese history with ruling power over the Emperor and all religious establishments. The government went on to function for several centuries until the last Shogun Yoshinobu surrendered to imperial forces in 1868. Shortly after, the Emperor officially relocated the capital from Kyoto to Edo and renamed it Tokyo or, 'eastern capital.' It has remained the administrative hub ever since. The following decades resulted in drastic expansion throughout Tokyo and the construction of infrastructure like locomotive railways. However, the city, as it stands today, is relatively new. Devastating air raids in World War II caused mass destruction, so when the war ended, reconstruction projects sprang up across the city. By the late 1950s, the skyline was brimming with modernised structures like the Tokyo Tower which became a symbol of hope for the Japanese people. Being the capital, Tokyo is a fantastic place to learn about Japanese culture, sights and dishes. Impressive art and history museums are found in most neighbourhoods and showcase artefacts dating back to antiquity – everything from traditional calligraphy to samurai attire. Four of Japan’s most prestigious museums and galleries are located in Taito’s Ueno Park, making it the perfect place for art lovers to spend the day. Surprisingly, Tokyo is home to thousands of parks and gardens which provide respite for travellers and residents alike. Areas such as the East Gardens at the Imperial Palace are stunning in every season - autumn paints the leaves crimson while in spring, you can see the famous cherry blossom. Take a stroll through the grounds (where the current Emperor Akihito still resides), and marvel at its immaculate design that dates back to the 19th century. A lake filled with koi fish winds through the east gardens and mirrors the surrounding trees, creating a scene so picturesque it resembles a painting. For many travellers, one of the biggest drawcards in Japan is the cuisine, and Tokyo - which has been awarded more Michelin Stars than any other city in the world - is a food lovers paradise. The streets of each neighbourhood are dotted with all kinds of restaurants: modest vending machine ramen shops sit beside lavish fine dining restaurants and shops dedicated to dezato (dessert). 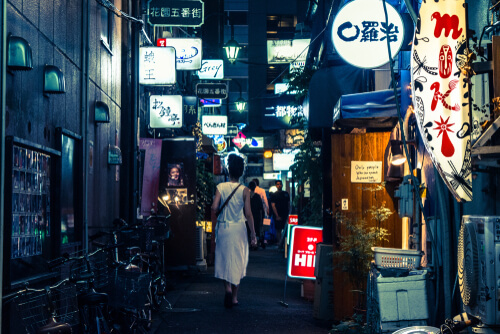 In Shinjuku, Omoide Yokocho is a maze of alleyways packed with bars and restaurants which typically specialise in one particular dish. Visit during the early evening and prepare to jostle crowds for a spot as each restaurant only seats five to 10 people.